But what else does Mr. 10 love? Well, he really loves this bite size salami from ALDI, and he really loves putting together his own lunch combinations. 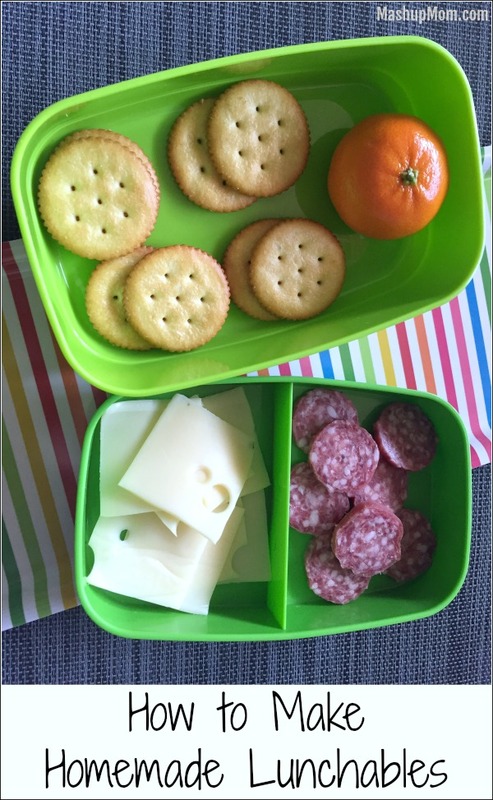 Soooo… let’s DIY some (slightly better quality) copycat Lunchables today, shall we? So: What’s better about these? These DIY Lunchables contain both real cheese (rather than “pasteurized cheese product”) and better quality lunch meat. All of the ingredients I purchased at ALDI today ran me just slightly more per lunch than buying basic Lunchables on sale: $6.77 for enough to make six homemade Lunchables. (Other than the bag of mandarins, which, well — you really should throw fruit into a basic Lunchables lunch anyway!) And, I still have half a box of crackers and quite a few clementines left over for other purposes. 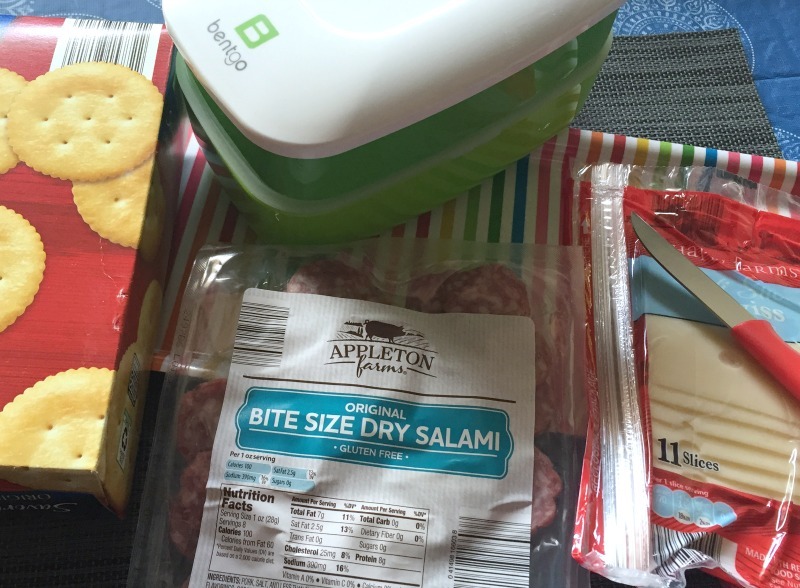 That came to $9.76 total, which works out to $1.67 per lunch (including fruit!) — with quite a few crackers and mandarins left over. If you’d like to just use those up or are making a week of Lunchables for two kids, you could add in a second pack of salami and second pack of cheese for another $5.38. This would give you sufficient ingredients to make twelve Lunchables total, dropping your cost to just $1.26 per lunch. You can also simply use plastic sandwich and snack baggies to separate the ingredients inside your child’s lunch bag; it’s less cute, but just as efficient. Place eight buttery round crackers in one compartment of your lunch container. Cut your cheese to be cracker-sized (noting that you’ll have 11 slices of cheese in an 8 oz pack, so you’ll want to go slightly smaller than quarters here and some crackers will make do with two smaller slices rather than one larger one). If using deli lunch meat or leftovers, also slice your meat cracker-sized. 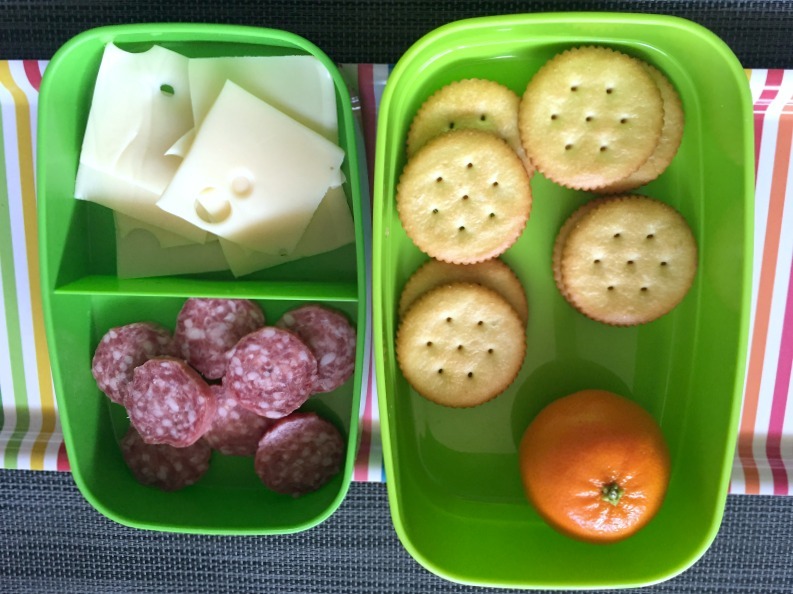 Just place the cheese and eight pieces of meat in separate compartments of your lunch container, add in a clementine or other fruit of your choice, and your homemade Lunchable is done. 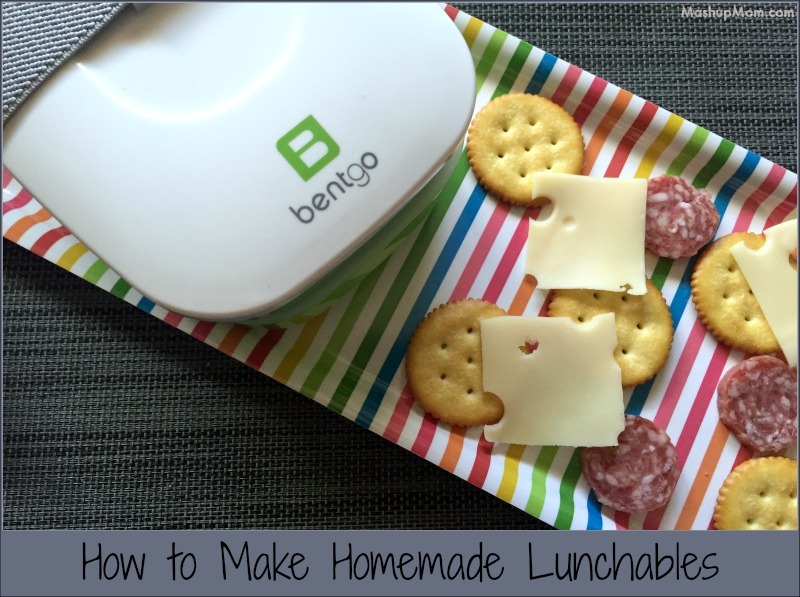 You can customize these homemade Lunchables for your own child’s (or spouse’s…) taste. Mr. 10 loves salami and Swiss; maybe your child would enjoy some quality deli roast beef and cheddar, or leftover thinly sliced turkey or ham with provolone. You could also easily make these gluten free by substituting your favorite GF cracker for the knockoff Ritz I used here. Any way you slice it: Cheese, crackers, and salami is not what dieticians’ dreams are made of. I do, however, feel a bit better about feeding Mr. 10 this homemade version than I do about picking up the pre-packaged variety — and he’s clearly not eating homemade Lunchables every day! Here he still occasionally gets all the fun of assembling his own lunch, without having to resort to purchasing pre-packaged. My son loves a homemade pizza lunchable. Premade mini crust, a squirt of pizza quick sauce in a small lidded bowl, shredded mozzarella, and either pepperoni or bacon bits. Add an apple and a cookie!